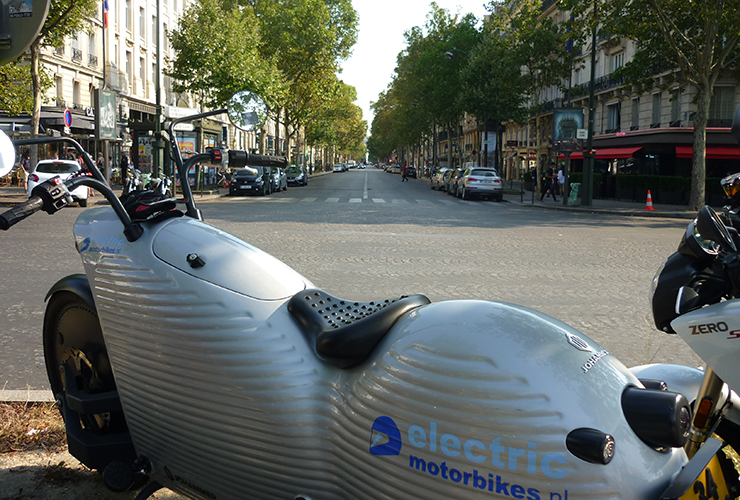 Riding the Johammer at the Electric Night Ride in Paris | electricmotorcycles.news | It's time. 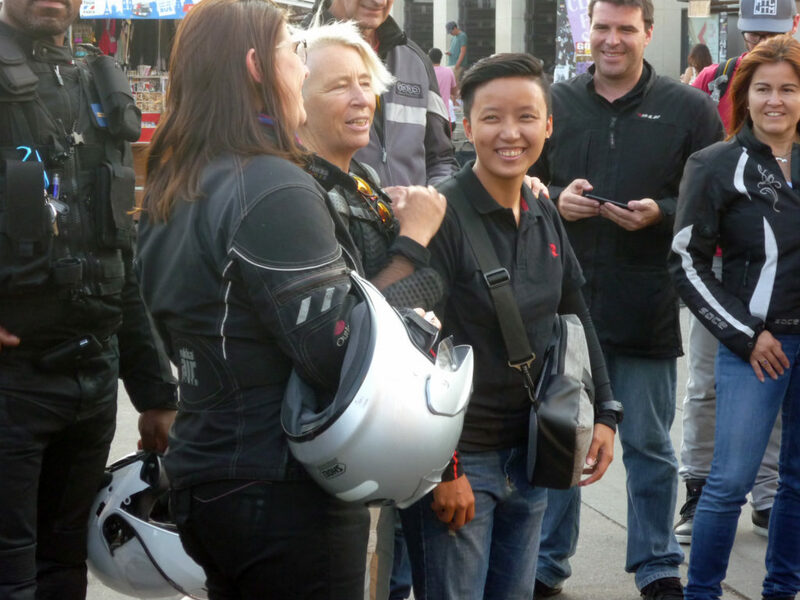 The Electric Night Ride is organised by Trui Hanouille with the purpose to bring as many electric motorcycles & scooters together in a road trip in a city (the past 2 editions took place in Antwerp – Belgium and Luzern – Switzerland). 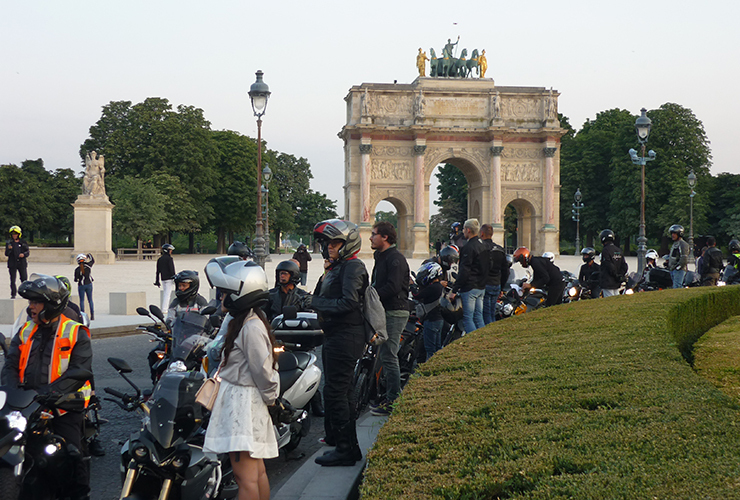 The current edition was planned in Paris (8 July) and started at the stairs of Montmartre for a 40 km silent road trip through Paris at 05:00 hrs in the morning. 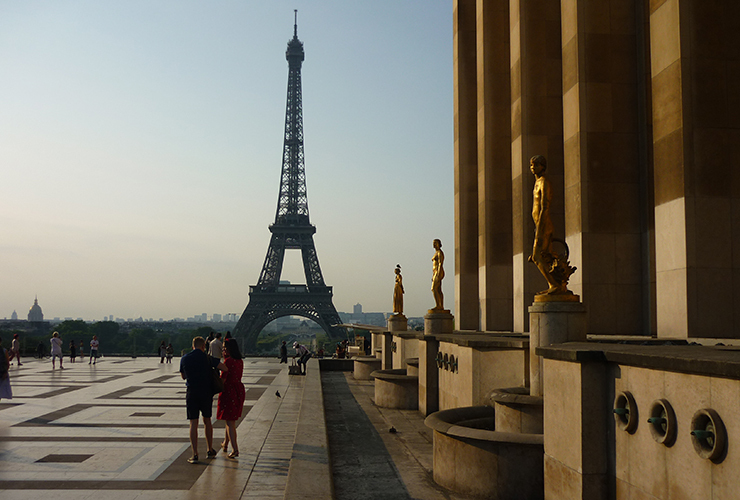 Bloody hell, 05:00 hrs in the morning … the group at Camping Paris wanted to leave at +/- 4 o’clock for Paris. That means we had to put the alarm clock at 03:30 hrs. You didn’t say that Mr Rongen! But hey, OK, no problem! That means a quiet evening, at least 1 glass of red wine (You’re in France after all …) and get some sleep for a few hours. Guess who was too late of course? The camping gates were already closed but the night watchmen (2!) were so clever to open the gates again by the time when we arrived at the gates … Gert-Jan, Andrew and myself saw some red lights disappearing in the distance (hmmm, wrong word choice in the area of Bois de Bologne). 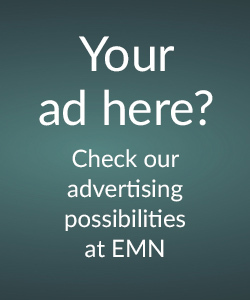 That’s one of the advantages of electric motorcycles, you have instant full power. Problem solved. We joined the group and head up to Paris. 1 rider had the road map (never a good idea) and there was some confusion of the direction at a certain moment – we lost some people (Yes, me, an American couple and a Dutch rider). 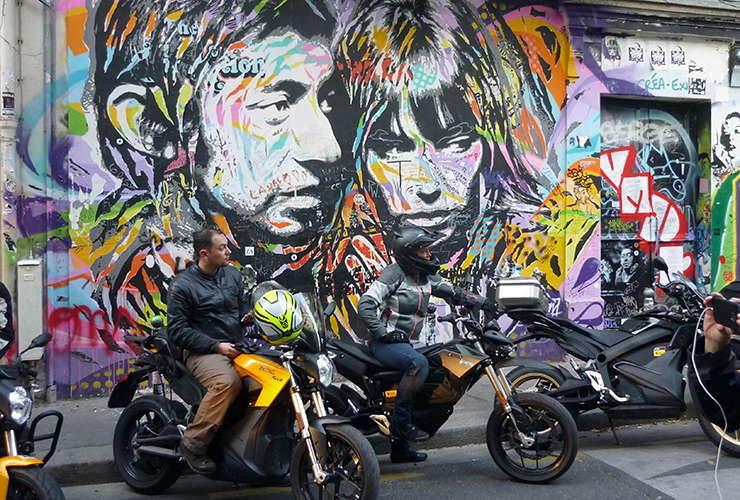 In the small streets around Montmartre we were stopped by 2 motards police because the American rider had a a dealer number plate at his rented motorcycle. But these guys were very friendly, they understood the situation and we only got a warning and they wished us a good trip. OK, but where was the start? And where was our group? Suddenly we saw a bearded guy with a golden helmet in a t-shirt crossing the crossroads with a Zero … It turned out that it was the guide who would accompany us at the ride. Our saving angel! 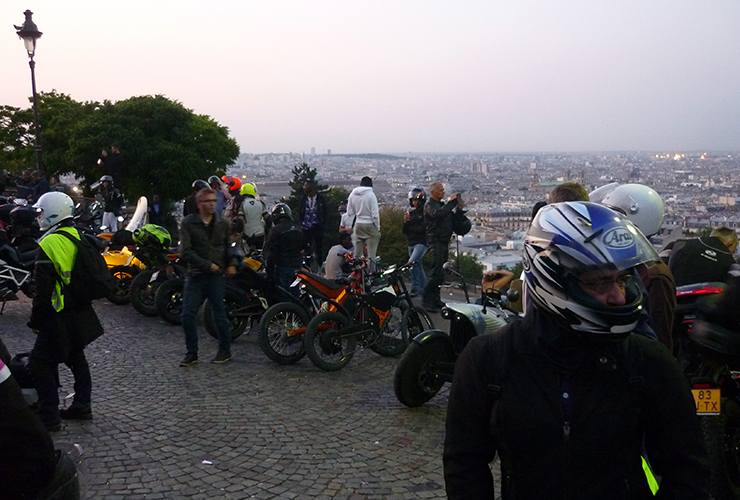 And we shared the group who had parked behind Montmartre. What we noticed during the ride to Paris and in the beginning of the Ride, was that there were a lot of drunk, stoned people in the streets. Some shouting at us (didn’t understand them, but it wasn’t a friendly tone) some were very funny and they applaused for us. The area at Montmartre (Sacre Cœur) was littered with empty bottles and other rubbish. The Parisian cleaning people have my deep respect! This year’s group was about 64 electric motorcycles & scooters. I saw also a One wheeler and some large electric skateboards. 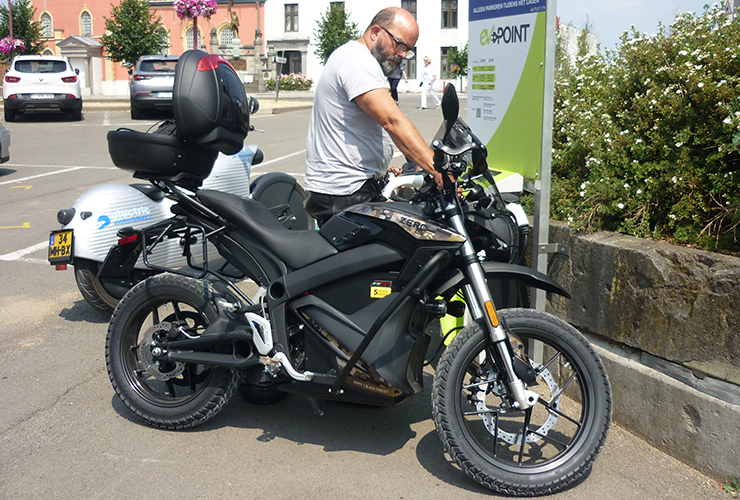 Zero Motorcycles was well represented by a number of different models; Andrew from Electric Motorbikes rode the DSR Black Forest, he was very proud of his 2 little headlights, mounted on the crash bars. Furthermore, I saw a few Energica’s (Eva and Esse9), a BMW scooter C2, a Vectrix scooter, 1 customised green Brammo, some young French people with a Super Soco, and a yellow Schwalbe. A delegation Johammers from Austria and Switzerland, a black EMCO scooter, even a Qulbix performance offroad e-bike. A NIU scooter and the French Eccity scooter … it was an assorted group, even in nationalities. 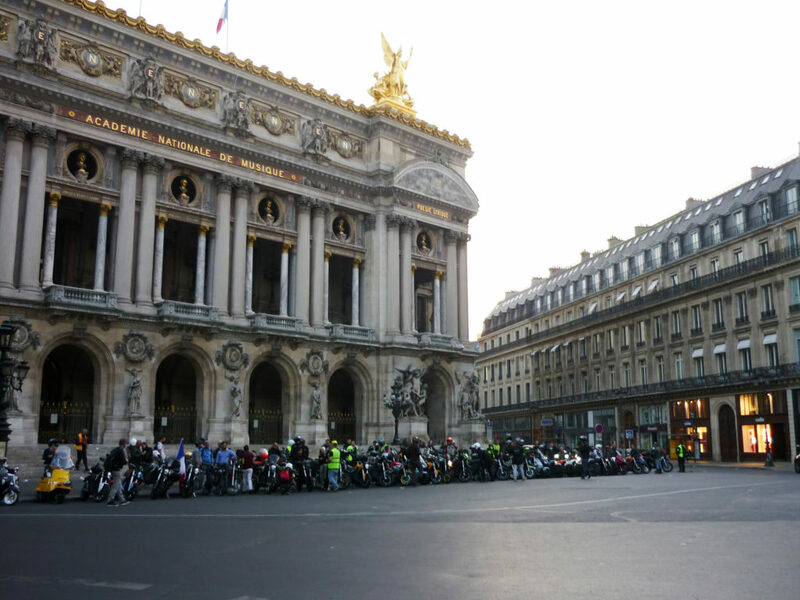 We did a nice quiet ride and enjoyed the scenery of Paris from different angles just before the city started it’s busy rhythm. Accompanied with 2 French policemen (no, not the same guys from above) on their Zero’s, we had no problems with some traffic points. The tour ended at the most iconic landmark in Paris, the Eiffel Tower, where we (finally) could have a coffee & croissants (I need my coffee in the morning). For those who wanted, a second ride was foreseen after breakfast to the Château of Versailles. With a smaller group, we reached quickly crowded Versailles. 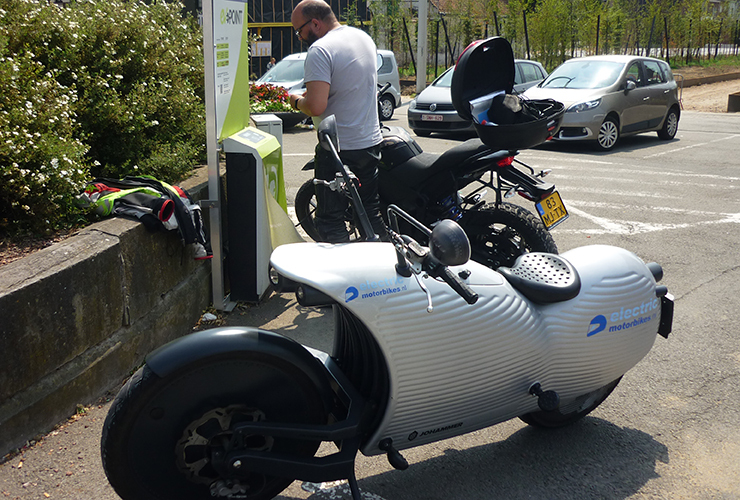 It was just a short visit to have some attention with our electric motorcycles. 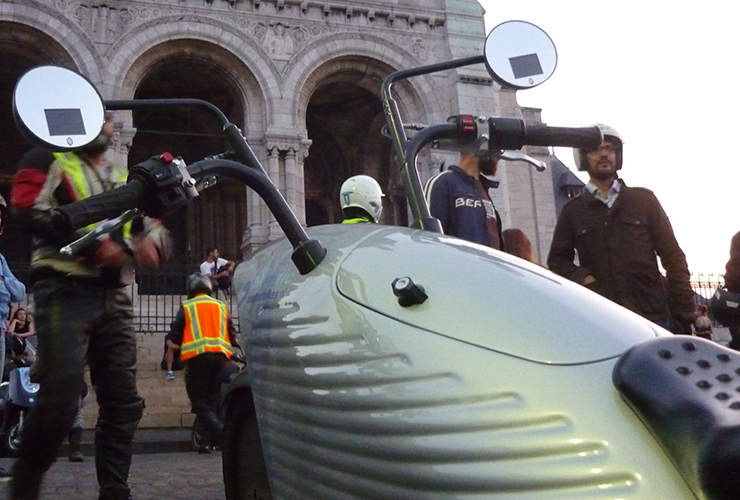 We said goodbye here and promised to return for the 4th Electric Night Ride, somewhere in Europe. Starting the Johammer is a ritual: after you have collapsed the side stand, you press a rubber key at the right side of the bike (there is a marking point). The bike is activated and in the lower part of the multifunctional rearview mirrors, you’ll get some digital information. There is no dashboard, you see. You push the button and off you go. You have to get used to these mirrors because I was regularly checking the percentages and the range that was changing all the time. This depends of your driving style and it became a sport to drive as economic as possible. 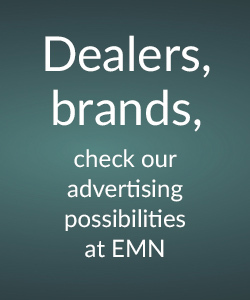 That’s where the regenerative braking system comes in. There are 2 braking handles on the steering handlebars but you can brake with your gas handle (I should say speed handle) If you turn this handle the other way round then you brake on the engine. The advantage is that you get energy back into the battery through regeneration. I used it all the time, with one hand you drive and brake (did I mention there is no clutch and no gearbox?). I loved this safe way of driving, but keep your eyes on the road and not always on the mirrors to see your data. When it comes to charging, I never had a problem. The charging is done via a 3 kW internal charger to an normal house socket or you can use a charging station on the road. 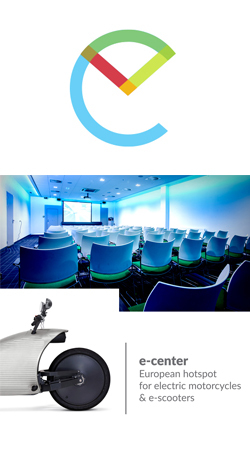 With an interface on your mirror you can choose from different amperages up to a max of 16 amperes. If you use this feature (16 amperes) the bike uses a fan for cooling down the system. Could be annoying when you are in a public place with a lot of people, it makes some noice. Let’s face it: this is a motorcycle for easy cruising on little roads and/or for people who love not the ordinary. The highway is possible at 120 km/h but then you consume a lot of energy. What I experienced myself is that the Johammer is slightly sensitive to tracks and ridges on the motorway, caused by trucks. You get the feeling that the rear wheel wants to follow a different track than the front wheel. I have owned 2 cruisers, so I was familiar with the typical cruiser sitting position: low, feet and legs forward. My body length is 1m82 and I placed my heels on the front footpegs so that my legs could rest on top of the body of the motorcycle. With this position my arms and back were spared a bit and it was comfortable to ride. Very handy is the reverse driving function. When you want to park the motorcycle or you have to manoeuvre with it, this is a nice feature but you have to play with your brake handle, it goes fast backwards … be careful! The Johammer makes a polite, supersonic sound. I never found it disturbing and when you accelerate, the sound ‘grows’ or decreases when you brake. It doesn’t rattle or has no mechanic sounds. It just fits with this motorcycle. I rode the J1.200 version. There exists also a 150 version (150 km range). 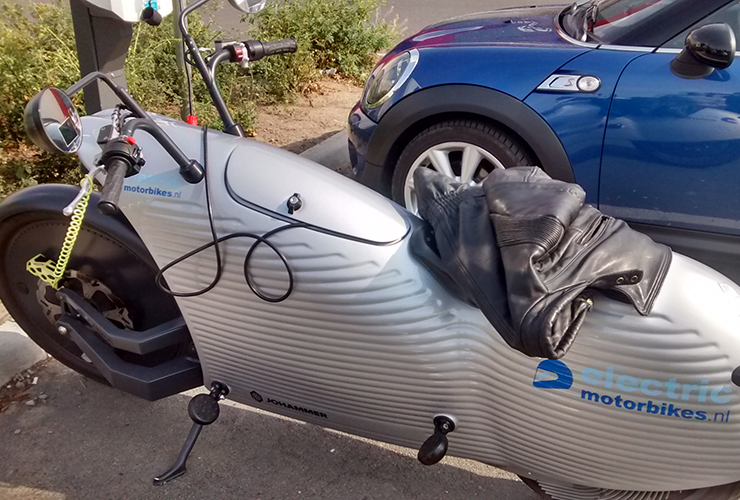 Thx to Gert-Jan from Electric Motorbikes to ride the Johammer!